The addition of two felt-lined jewelry drawers make this arch top clock a thoughtful and unique choice. Fluted columns, and a polished brass tone bezel create a classic appeal. Beneath the convex glass crystal lies an off-white dial with black Roman numerals and black serpentine hands. Finished in Windsor Cherry on select hardwoods and veneers with Quartz movement. 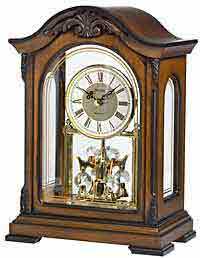 Size: H. 12" W. 9-1/2" D. 4-3/4"
Clocks for sale at The Clock Depot including the 635-112 at discount prices.